Well, it seems that summer is drawing to a close. My sense of time has been seriously disturbed by becoming a mother/sleeping on a newborn schedule/not going to work. I mean it more than ever when I say that I don’t know how summer slipped by so fast. While I’m sad to see it go, I do love autumn. I love how the summer heat lingers while the leaves begin to turn. I love all of the excitement around the first day of school. Most of all, I love the first few days of rain after weeks of sunny weather; it just feels delicious to break out the boots and sweaters for the first time of the season. So…instead of mourning summer’s departure, let’s praise fall’s return. To help with this, Jess and I are bringing back one of our favorite season themes: celebrations. While we have tackled this theme twice before, we have never featured it during Fall. With the abundance of holidays and preparation time for even more holidays, Fall really seems like the perfect time to get celebrations-y. So join us as we learn to better appreciate life in moments big and small. 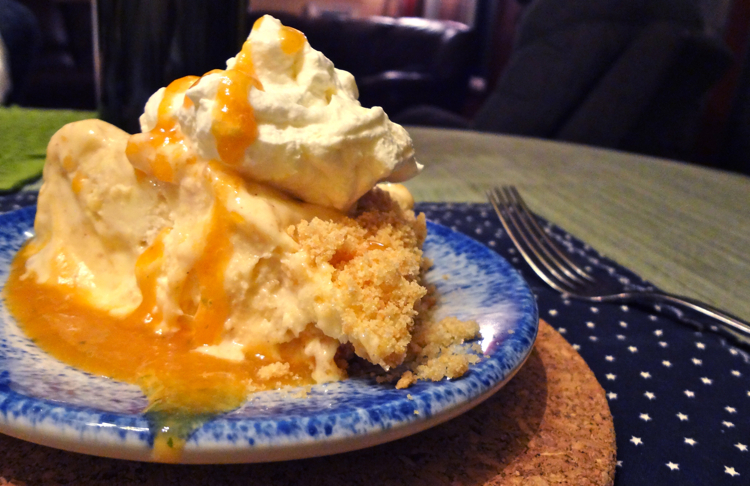 To start out, why not make an early fall meal a little more special by making this ice cream pie for dessert? Fresh peaches are abundant this time of year in Oregon and they are so good. An incredibly indulgent way to feature this fruit is with an ice cream pie. It’s rich, but helps battle the late summer/early fall heat. This pie was inspired by this recipe from Dailey’s, which is a restaurant in Atlanta. I haven’t been there, but based on how this pie tastes, I bet it would be good. In a food processor, blend the first three ingredients until fine. Add melted butter and hand-mix until moistened. Press into a pie pan. Cool crust in the freezer while moving on to the next step. Let ice cream sit at room temperature until slightly soft. In a large bowl, mash all filling ingredients by hand with a spoon until just combined. Use a mixer to beat all cream ingredients until fluffy. To Serve: Remove pie from the freezer and slice. Top each slice with a large dollop of whipped cream. Drizzle with sauce. Serve immediately. Prepare to be in love.